At Apprising Ministries you will have heard me talking more and more about the new spirituality which has now slithered its way deep into mainstream evangelicalism from its den in the neo-liberal cult of the Emerging Church. The fact is this also a neo-Gnostic spirituality that’s most pointedly on display in the misguided mysticism at the heart of the new big tent form of Progressive Christianity now being spread by the Emergent Church, a Liberalism 2.0 called Emergence Christianity that EC guru Brian McLaren begins laying out in his latest book A New Kind of Christianity. The most dangerous aspect of the new spirituality is this idea of some supposed “spiritual disciplines,” which must be performed in order to more fully “experience” God. Space does not allow a discussion of “the deeper life” that orthodox Christians such as A.W. Tozer would speak of, but we are clearly not talking about the same thing—nor am I necessarily endorsing it. Here I am simply discussing the heterodox practices culled from so-called “Christian” mystics that they in turn adopted from Eastern religions and then passed off as consistent with the historic orthodox Christian faith. It should also be noted that those who are following the blind guides in the Emerging Church will insist that these disciplines are not necessarily all the same. However, the truth is that most of these particular practices are indeed aligned with what Living Spiritual Teacher and Quaker mystic Richard Foster—one of the leading “authorities” on this Contemplative Spirituality/Mysticism (CSM)—refers to in his classic book on the subject Celebration of Discipline (CoD) as “The Inward Disciplines.”  And it also needs to be noted that Foster’s spiritual twin, Southern Baptist minister Dallas Willard, teaches the same. Foster, who considers Merton to be one of his own mentors, then tells us what happens in this meditation “is that we create the emotional and spiritual space which allows Christ to construct a sanctuary in the heart.” And Foster is telling the truth when he writes that meditation “opens the door.”  It is what inevitably comes through that open door which is the concern of this particular work. As we progress with this you will come to understand the dangerous spiritual reality about what Foster tells us concerning the eventual effect that arrived at through the meditation “of this kind [which] transforms the inner personality.” Indeed, it does. The problem is this just isn’t true as you have seen from CZ and from what Tony Jones himself admits in SW. As a matter of fact on page 73 of SW Jones tells that the late M. Basil Pennington was “one of the Trappist monks who has developed the modern practice of Centering Prayer.” Among the “resources” that Jones recommends is Pennington’s book Centering Prayer: Renewing An Ancient Christian Prayer Form (CP). You will also find it interesting to note that in CoD Foster personally recommends another book called The Living Testament: The Essential Writings of Christianity Since the Bible, which just happens to be edited by Pennington and one Alan Jones—another name that should be familiar to those following this work. Islam is much more gracious towards evangelical Christians who are faithful to the New Testament, than Christians are towards Islamic people who are faithful to the Koran. The Islamic faith will ask, “Are you faithful to the book that you have?” Mohammad was very understanding that there was great truth in Christianity. He differed with us in that he felt he had a more complete truth, and Islam would hold to that, but Mohammad contended that we would ultimately be judged in terms of the truth that we had at our disposal. 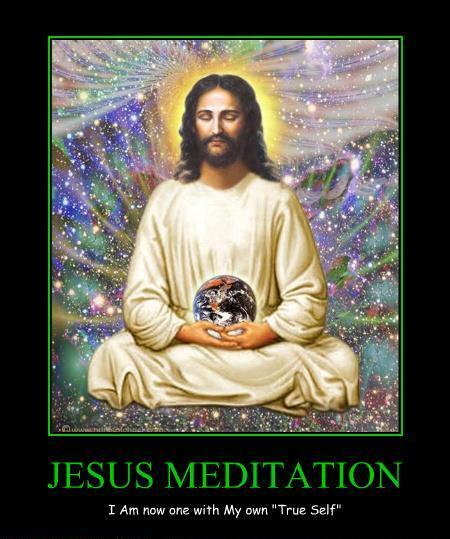 But this kind of universal foolishness is the direct result of the deception which comes when one continually practices this unbiblical form of transcendental meditation for the Christian (see—2 Thessalonians 2:9-12). So it should not come as a great surprise then as I show you that this form of Centering/Contemplative Prayer, or so-called “Christian” meditation, really is nothing more than transcendental meditation lightly sprayed with Christian terminology. This is why there is such a grave danger in the practice of this neo-pagan Gnostic Contemplative Spirituality/Mysticism which has been spreading like a spiritual wildfire through the Church of our Lord for years now, particularly in Young Adult and Youth ministries. And the most prominent purveyor of this so-called “Christian” mysticism is Richard Foster, whom I mentioned earlier. A member of the The Religious Society of Friends (the Quakers) Foster is quite familiar with mysticism and very well versed in “the silence” aka meditation, and none other than Emergent guru Brian McLaren himself calls Foster and his disciple Dallas Willard “key mentors” in the Emerging Church. Foster cites and/or quotes Merton on at least nine separate occasions in Celebration of Discipline, yet Merton was not a Christian as far as we can tell. He was a twentieth-century Roman Catholic who had so immersed himself in Buddhism that he claimed he saw no contradiction between Buddhism and Christianity and intended to become as good a Buddhist as he could. He takes people into deep places within themselves… At the core of Thomas Merton’s spiritual writings is the search for the “true self” and our need for relationship with God, other people and all of creation… Merton believes that we must discover God as the center of our being. It is in this center that all things tend and where all of our activity must be directed. And it is precisely this “transformation of consciousness” that is a major source of concern in my work right now at AM. What makes the Emergent Church so very dangerous spiritually to your youth now within mainstream evangelicalism is that we have quite questionable “theologians” such as Foster, Tony Jones, and Brian McLaren—as well as practioners and Emerging Church pastors like Rob Bell and his friend Doug Pagitt—molding the impressionable minds of young people who are simply not equipped to see through this non-Christian neo-pagan CSM. For that matter it seems we have very few leaders within the evangelical camp itself who appear capable of recognizing just how deeply the Devil has now penetrated into the Church of our Lord all over again with his repainted Gnosticism. In this generation it has become critical that the American Christian Church repent of virtually ignoring the spiritual side of our relationship with the one true and living God as revealed in the Bible. Men and women, to be a born again Christian—by God’s grace alone; through faith alone; in Christ’s finished work on the Cross alone—is to be indwelt by God Himself. And since Jesus of Nazareth—the LORD God Almighty Himself in human flesh—explains that God is Spirit, then it logically follows that we’re going to have to be involved in a spiritual life. Just as we see people “possessed” by demons (fallen angels) in the Gospels, so it is that we who have been regenerated are quite literally to be possessed ourselves by God (see—John 14:17; 1 Corinthians 6:19; Ephesians 5:18). And the sooner we get over our fear of this the better, because what has happened now in our pagan “postmodern” nation is that some people have been quickened by God to become spiritually hungry for more of Him, which is a good thing. However, at the same time Satan has now rushed into this vacuum with his new, but really very old, spirituality. As difficult as it is, we need to pray for a balance between a very real dead orthodoxy within much of the contemporary Christian church and the proper spirituality rooted in Sola Scriptura. Tragically this has now given rise to a postevangelicalism and the Emerging Church, which are both rooted in a neo-orthodox, and highly subjective, “experience interprets Scripture” approach to the Bible that has rapidly coalesced into what is becoming the Ecumenical Church of Deceit. 1. Tony Jones, The Sacred Way: Spiritual Practices for Everyday Life [Grand Rapids: Zondervan/YS, 2005], 5. 2. Richard Foster, Celebration of Discipline: The Path to Spiritual Growth [New York: HarperCollins, 1998], 12. 4. Jones, Sacred Way, 79, 80, emphasis mine. 5. William Johnston, Christian Zen: A Way of Meditation [Bronx: Fordham University Press, 1997], 25. 6. Foster, Celebration of Discipline, 20. 8. M. Basil Pennington, Centering Prayer: Renewing an Ancient Christian Prayer Form [New York: Doubleday, 1980], 15. 10. Thomas Merton, Conjectures of a Guilty Bystander [New York: Doubleday, 1966] , 158.